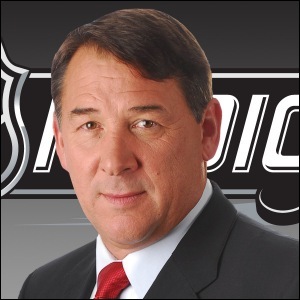 Mike Milbury has done it again. And when I say “it” I mean he has again said something thoughtless, rash, hateful, hurtful and unintelligent regarding some aspect of the National Hockey League. 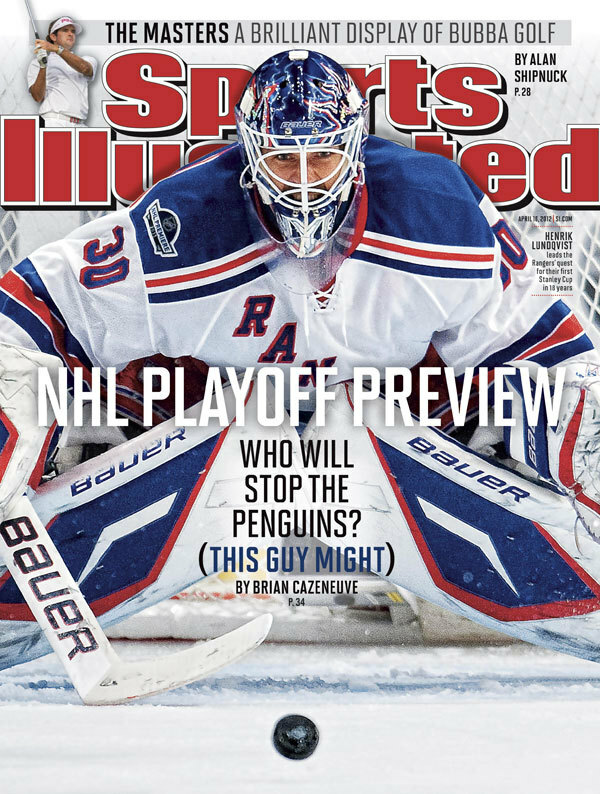 This time it was about Sidney Crosby. Earlier today, Milbury joined 94WIP’s Angelo Cataldio and The Morning Team to discuss the Sunday’s Pens Flyers game that nearly resulted in Philadelphia’s head coach Peter Laviolette attacking Penguins assistant coach Tony Granato. Laviolette’s anger was brought about from a heavy hit on Flyers forward Danny Briere at the end of the game, which ultimately ended up injuring Briere’s back and resulted in a 10-player brawl. Minutes before the hit and brawl, Pens captain Sidney Crosby was involved in an altercation with Brayden Schenn of the Flyers. Crosby gave Schenn a shot at the end of a play and then started off toward the Pens bench. Schenn followed from behind and crosschecked Crosby, knocking him to the ice. No penalties were assessed on the play. Mike Milbury had plenty to say about both Crosby and the bench fight between Laviolette and Granato. Fortunately for Milbury, there wasn’t enough evidence to bring criminal charges. 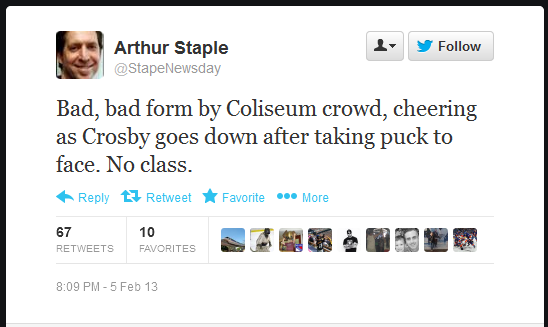 But regardless what happened in court, it’s clear that Milbury is a joke of a human being. He was a goon as a player, piling up penalty minutes and nothing else. Oh and he also ruined the New York Islanders as the GM before he “stepped down” from the position. That should be sufficient back ground for now. Yeah, he should remember doing that, because once during a game he climbed over the glass and attacked a fan who hit one of his players with a rolled up program. That incident led to the NHL installing higher glass to prevent goonism from morons like Milbury spilling over into the crowd. There is a link to a story and video from NESN below. You can see him in the top-left part of the video at the 36 second mark. This isn’t the school yard and you aren’t nine years old Mike. Attacking someone to prove a point? Apparently your parents taught you nothing and I hope you don’t teach the same to your children. Telling Dan Bylsma to “take off his skirt” and physically engage with Laviolette is one of the stupidest things I’ve heard lately. Whatever the situation is, it is NEVER ok for a coach to get violent during a hockey game. Laviolette was fined $10,000 for standing up and yelling. 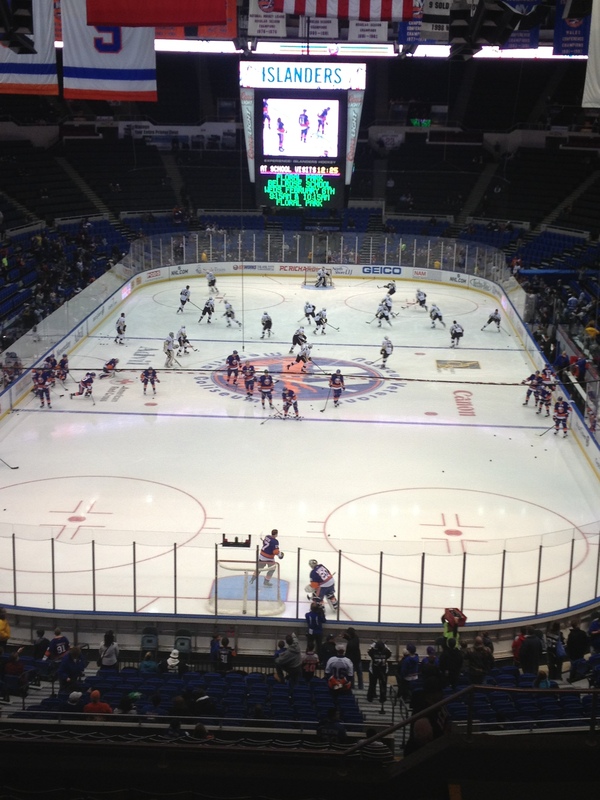 Can you imagine what the NHL would have done if there was a physical confrontation? You’d be looking at suspensions at the most critical time of the year, heading into playoffs. That wouldn’t help anybody. Are you kidding me? Concussions and headshots are the biggest topics in hockey right now. With the changes to Rule 48 and Brendan Shanahan dealing out suspensions on video, it’s unfathomable to hear that someone as close to the NHL as Milbury can make light of Crosby’s situation. Crosby has done more for the game than Milbury ever has. He’s the face of the league and like him or not, he generates revenue and makes the game more interesting. 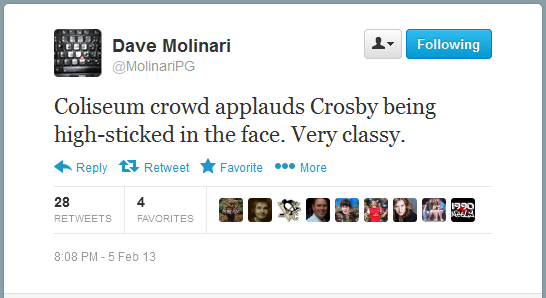 Sure, Crosby is not the perfect gentleman. He will never win the Lady Bing trophy. But it’s pretty hypocritical for Milbury to be at odds with a player that isn’t the perfect gentleman. Sure, Sid may jaw at the refs and opposing players, but he never assaulted a 12-year-old kid…(allegedly). And it’s not like Sid doesn’t get hit. Other players will continue to target him because it’s hockey. Everyone gets hit. I didn’t take a whole lot of exception to Schenn crosschecking him because Crosby started it. He knows it and Schenn knows it. It wasn’t to the head and Sid probably bought it a little bit. It seemed to me like no harm, no foul. But when your star player gets hit after the whistle, it’s the other players’ and coaches’ responsibility to deal with the situation. Bylsma sent out his fourth line –the checking line – to send a message that you can’t hit Crosby like that. It’s a team standing up for itself. The Flyers responded with the scrum after the hit to Briere. Again, that’s standard hockey. Hell, even Laviolette screaming at the Penguins’ bench was warranted, to a degree. He could have kept a little more control rather than climbing up on the boards, but it never got physical. Mike Milbury doesn’t understand diplomacy and talking things out. He doesn’t believe in playing by the rules and he doesn’t believe in civilized society. He may continue to talk and voice his opinion, but if NBC knows what is best for the network, Milbury will be uttering the rest of his comments under his breath from the comfort of his home while collecting unemployment. 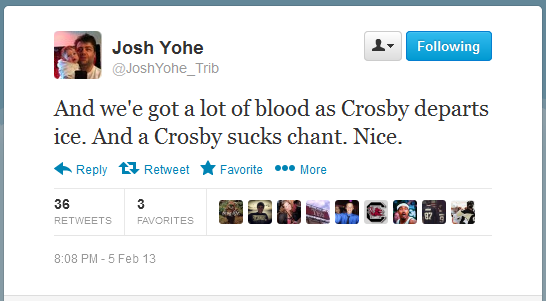 Pittsburgh Tribune Review Penguins reporter Josh Yohe said it best in his tweet this afternoon.